When flooding occurs, it causes havoc that feels as though it will never come to an end. As well as the water damage does to homes and businesses, it is also important to note that it can also cause sewage backup San Diego. When this occurs, it goes right back into the affected houses through the drain pipes which then causes even more damage. Moreover, damage caused by sewage is expensive, difficult to repair, and dangerous to health. 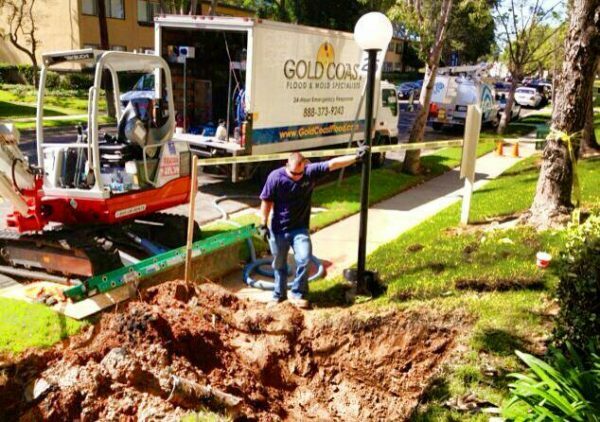 Without even realizing it, most insurance policies for homes and businesses do not cover sewage backup San Diego which leaves millions of people vulnerable each and every year. According to many insurance companies, sewage backup is a specific addition that needs to be made to an individual policy. From most insurers, this will cost around $50 extra per year. Unfortunately, many homeowners and business owners do not even realize that they have a responsibility towards any plumbing repairs or general maintenance for the pipeline that runs between the building to the sewer mains. This pipeline, often called the sewer lateral, belongs to the property itself and this even includes parts that could extend into the street. If this becomes cracked or damaged in anyway, maybe it gets attacked by tree roots, this will make any sewage backup San Diego problems even worse. Tree Roots – As mentioned previously, tree roots are actually a common cause because they travel into the sewer lines and cause cracks over time. Even if they start small, they find their way into small cracks and grow which widens the damage. Normally, the roots will enter the pipe at a joint to then create a blockage. As the bush or tree grows, the roots extend and can act in different ways. If you think that it is the city’s trees that are causing the damage, you can call a professional plumber and they will normally take a sample to work out who is responsible. If the damage is caused by a combination of city and property roots, the cost will normally be shared. Basement Water – Commonly, water found in the basement will be as a result of rainwater creeping into the foundations. In older buildings, this problem is seen more often because cracks will have developed in the foundation over time which gives the water a route inside. Over the years, the walls and foundation can lose the ability to stay waterproof and water will settle in the basement. If there are a number of consecutive rain storms or the ground becomes saturated over a period of weeks or months, this problem can become frequent. To resolve this issue, the drainage will need to be improved to ensure that water moves away from the property rather than towards it. For homeowners, it might be wise to water-seal the basement. Sanitary Main – On the other hand, there could be a bigger problem with the city sanitary main. If a problem isn’t found quickly enough, the main will backup until eventually it reaches the homes and businesses nearby. Normally, this issue will be found before it becomes a major problem allowing the owner some time to phone a professional plumber. If the problem doesn’t get picked up in time and you have water running into your basement, you should call the city public works office who will send a city operator to investigate. Homeowners and Business Insurance – Although this isn’t why the floods occur in itself, it is important to note once again that not all insurance policies will cover flood damage and they may not even tell you about it when you first get the insurance in place. When checking your policy, make sure you specifically ask for flood coverage. If your community partakes in the National Flood Insurance Program, federal flood policies will be available to you. If you want to find a representative near you, your local insurance broker will have all of the details required. Paper Products – If you want to prevent backups in the city main or lateral, your first step should be to properly dispose of paper products such as diapers, paper towels, and feminine products. Because they do not deteriorate as quickly as bathroom tissue, they will cause blockages. Grease – Similarly, you should also avoid putting grease down your sink because grease will later solidify and cause blockages. If you ‘water it down’, this actually prolongs the solidification process rather than stopping so, either way, you will be affected. When you are finished with cooking oil, simply pour it into a container and throw it in the bin when cool. Poor Plumbing Decisions – Often, people choose to connect their sanitary sewer to French drains, flood control systems, and even sump pumps. Not only is this illegal, it will damage the line and cause debris to create clogging. If you suspect that the previous owner did this, consult a qualified plumber who will fix the problem. Plastic Pipes – Nowadays, there is a fantastic alternative to the old pipes – new plastic piping. If you have a problem with tree roots, this should stop them from entering the line in the future. If the problem persists even with plastic piping, you may want to consider having the roots cut every so often. Backwater Prevention – In order to prevent sewer back flows, you may want to install a backwater valve as this will allow the sewage to go out whilst stopping anything from coming in once attached to the sewer line or even the drain line. As the owner of the property, you will be responsible for this step. Overall, the cost will depend on what type of plumbing you have as well as how difficult the final install will be. What to do about Sewer Backup? Once the cleanup is complete, you will want to look towards filing a claim. When making a claim, be sure to include any photos of the damage and itemize all goods lost to damage. When making repairs or cleaning up the damage, keep all receipts for costs as these can be recouped. When you have this, contact your insurance agent as soon as possible.